Experience a sea kayaking holiday escape to Kyuquot, with delicious meals, engaging kayak outings, and exploring on forest trails on a remote island in the Pacific! Just one day shorter than our 5-day Sea Otter Kayak Tour, which is a Canadian Signature Experience, this compact 4-day adventure is a great choice for tighter schedules (when you know you need to squeeze it in and just get away! 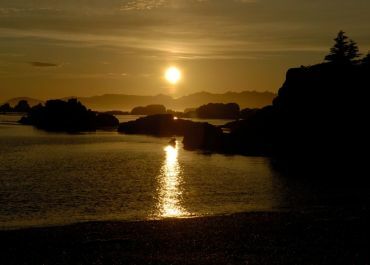 ), budgets, or as a 'taster' if base camp sea kayaking is something new for you. 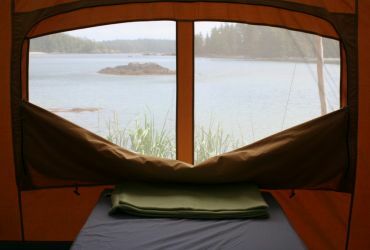 This adventure fuses the rustic comforts of glamping, with the opportunity to explore Spring Island and the historic Mission Group of Islands by sea kayak, while experiencing sea otters, rugged shorelines, idyllic shell beaches, and many other delights, which makes it feel like you've had a much longer vacation. 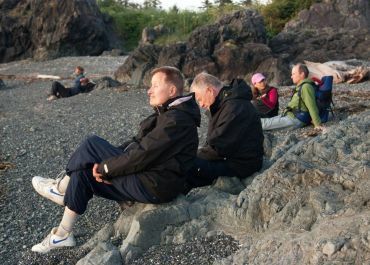 These trips begin and end from your accommodation in Comox/Courtenay or Campbell River, include van transportation, a scenic boat ride to our Wilderness Retreat base camp, and the perfect mix of personal and group time once on the west coast of Canada. Our daily routines flow with the tides, weather, and wildlife. I loved this trip. I can't say enough good things about my experience. The area is so gorgeous - it really created a space within myself. Our professional sea kayak guides enjoy sharing their knowledge and skills, and learning together with you! We are committed to helping you to feel comfortable if in a kayak for the first time, or to further developing your confidence and competence if already an experienced kayaker. 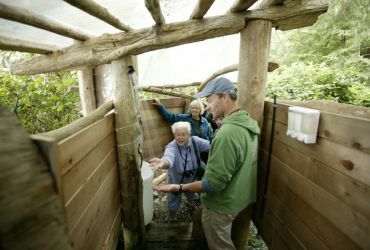 When on interpretive walks, if we don't have answers for your many questions, we'll try to find out more in our substantial resource library in the dining and activity shelter at our island retreat. 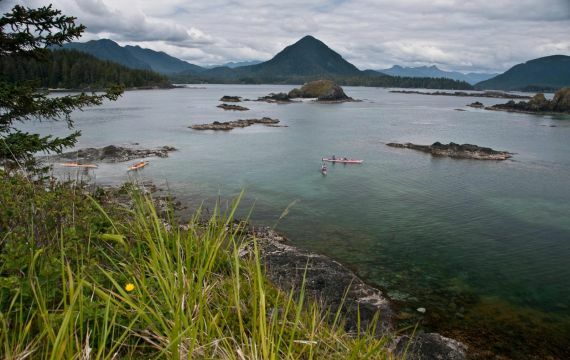 These 4-day (3 night) trips offer a great getaway to experience west coast sea kayaking in Kyuquot! Transportation: includes two-way ground transport from Comox/Courtenay or Campbell River, and two-way water taxi from Fair Harbour. Rates are based on double occupancy. A $225 single occupancy upgrade may be available if wanting to guarantee having your own tent. All that you really need is your personal clothing and a sleeping bag (which you can also rent from us). We take care of the rest! A detailed packing list is included in your pre-trip information package which is provided upon registering. Two-way ground transportation with professional drivers (van shuttle) to/from your overnight accommodation or vehicle parking location in Comox/Courtenay or Campbell River; parking available. All scrumptious meals and snacks once with us in Kyuquot - everyone is pleasantly satiated! Innumerable other things - big and small - that make your experience with us feel comfy and complete! We are happy and able to accommodate a range of dietary restrictions and allergies. Depending on what works best for you, you may also choose to bring a few snacks or supplements - please make sure you discuss this with us well in advance so we have your needs covered. Alcoholic beverages not provided or served - please bring your own favourites! Consider bringing a sketch book, paints, photographic equipment, or that book you're itching to dive into - it's your holiday! If preferred, you are welcome to bring your own PFD or paddle, and there is space for this in the van shuttle to Fair Harbour. You are also welcome to bring your own kayak if driving yourself to Fair Harbour, with a savings of $125/person for providing your own kayak and transportation. Morning van transportation from your accommodation in Comox/Courtenay or Campbell River; four to five hour scenic drive on northern Vancouver Island to remote Fair Harbour; chartered water taxi transportation to our Wilderness Retreat base camp on Spring Island - on the outer edge of Canada's west coast! Early afternoon arrival with a light lunch, welcome orientation and tour of base camp facilities; time to settle into your waterfront tent accommodations. 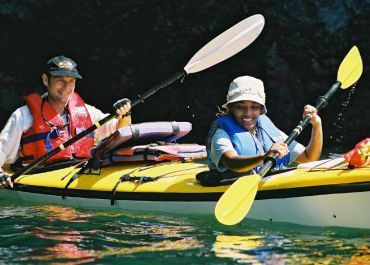 Relaxing introductory kayak outing or forest trail walk to spectacular and rugged exposed west coast shoreline and scenery - use your arms or legs and get your bearings! You've arrived! Dinner and evening activities, including preparation for next day's kayaking. Possible evening paddle in sheltered bay. Continued orientation/refresher to the kayaks, safety equipment, and paddling strokes; safety briefing appropriate to the individual experience and day's activities. 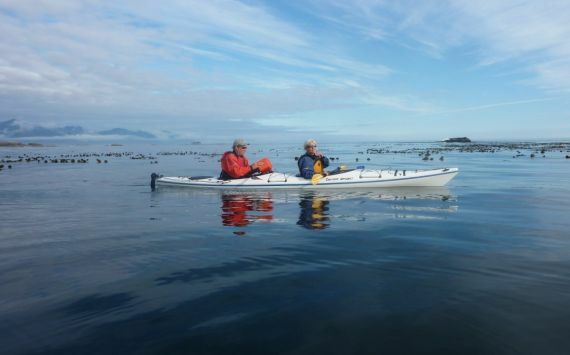 Day trip paddle through local islet clusters, abandoned First Nations Village site area, and sea otter viewing. Lunch break and shoreline intertidal life orientation on sandy shell beach. More exploring and wildlife viewing by kayak in the afternoon. 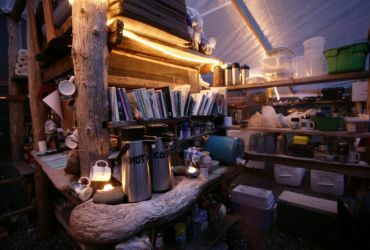 Return to established camp comforts...and maybe enjoy a hot shower, nap, time on a stand up paddleboard, a good book, a relaxing beverage, wandering along the expansive beach,...?! Your call! 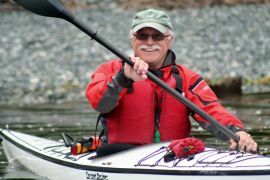 Evening appetizers, dinner, and opportunities for on-water kayak skill development with one-on-one coaching. Possible sunset paddle or walk...or just enjoy time around the fire visiting with others. As per day 2, with additional day tripping destinations possibly including: estuary and river exploration, fossil finding, and "salmon forest" hike. Can also explore more exposed outer coastlines if sea conditions are appropriate, including sea arches and sea caves. Your day could include anything from: black bear viewing and possible wolf sightings; to a possible visit to the remote First Nations village of Kyuquot; to intertidal exploring and tide pool curiosities. If the seas are rough, no worries, there are plentiful shoreline hikes, beachcombing, and world-class photography opportunities. It's endless! Possible sunrise paddle before breakfast. 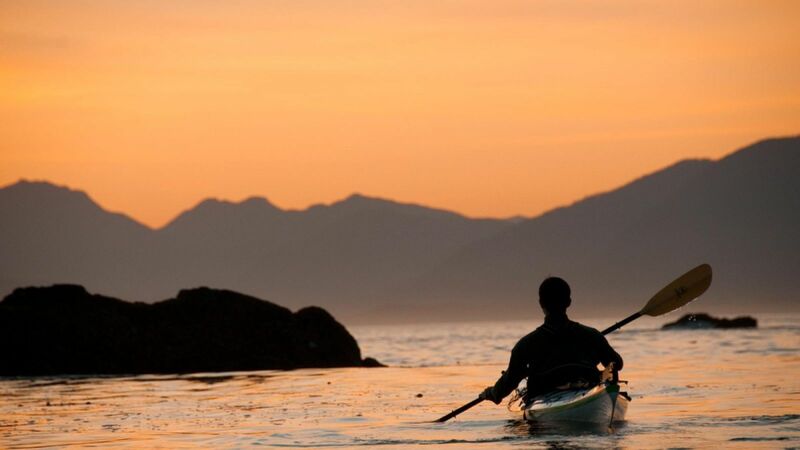 Similar activities as days 2 & 3 during the morning, including the option of a morning paddle through nearby sea arches and islets, or short interpretive walk into ancient temperate old-growth rainforest...making sure you leave time to relax and reflect - fully absorbing the majesty around you. Packing of personal gear in preparation for an early afternoon water taxi departure after lunch. The challenge with a base camp, is that you can really "move in" quickly and spread your things everywhere! Return van transportation to your accommodation or connecting travel plans in the Campbell River or Comox/Courtenay areas. Your mind will likely be planning your next visit!